A Wellington business was nearly charged $20,000 for their blinding window display in time for the Wellington World of Wearable Arts. The display was a part of the Welly Loves WOW Window Dressing Competition. Second in charge tea brewer, Dominique Hopson, ran the workshop making four different tea flavours. 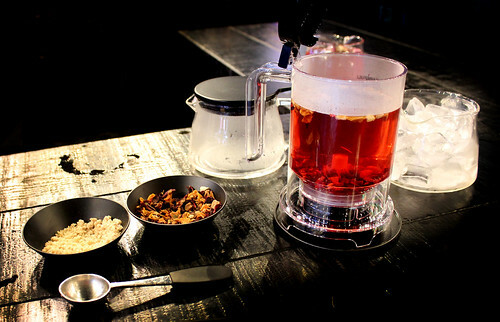 T2 took a creative turn with their display by including an interactive iced tea workshop. Tea brewer Dominique Hopson says this is the first time they’ve participated in WOW, and they did it by having shoppers make their own tea mixes. “We’ve always done workshops, but never like this where you can get a hands on experience and actually make the tea yourself. So it’s a fun, creative way to participate,” she says. Creations included a New York Breakfast milkshake, Chillin’ Beets iced tea and the store’s most popular tea, Fruitalicious. With the theme of deep blue and purple or reflection, pet shop Smack Bang on Tori Street matched its window to in store decorations. “We’ve done that in the obvious way in that they are literally reflective dots, but we also wanted to reflect what’s on the wall across the road,” explains owner Amelia Lingonis. The window is covered in gold confetti, to mirror their gold lights and decorations. “On a sunny day I think I’m blinding the office workers across the road which is always exciting,” laughs Amelia. Amelia planned for the gold confetti to extend to the footpath, but says the council threatened her with a $20,000 fine. Instead she is enjoying the competition between fellow Wellington businesses. “I think we’re all on the same boat. What I found with retailers in Wellington is that we’re all pretty happy to work together for the benefit of all of us. The competition ends on 14 Sunday October.